Most profiles of CEOs lionize their subjects, playing up their managerial strengths while wholly ignoring any personal weaknesses or quirks. Author Leander Kahney, however, understands that personality and management style are often inextricably linked and that it is not unusual for someone to rise to power despite — or even because of — his or her difficult personality. 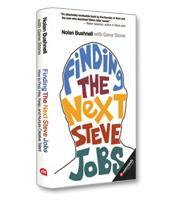 Throughout Inside Steve’s Brain, a book that is part biography and part management tome, Kahney offers a fascinating glimpse into the mind of Apple and Pixar CEO Steve Jobs. Each chapter of Kahney’s book focuses on a different aspect of Jobs’ personality and management strategy — even the seemingly unflattering ones. One chapter, for instance, is titled “Despotism: Apple’s One-Man Focus Group.” In it, Kahney describes how Jobs is intimately involved in every aspect of Apple’s design process. No detail is too small to warrant his attention. He is relentless in his insistence on simplicity. There are no endless consumer polls and focus groups: It’s all about pleasing Steve; if he likes it, he assumes the public will too. Another chapter is called “Elitism: Hire Only A Players, Fire the Bozos.” Steve Jobs does not suffer fools gladly and has no patience for employees who he feels aren’t performing up to his exacting standards. According to Kahney, Jobs views the world as full of geniuses and bozos, with little to no middle ground. He is, unquestionably, a very difficult man to work for. Yet he has managed to forge and sustain a number of successful long-term partnerships and cultivate workplaces that encourage collaboration. It comes as no surprise, then, that Kahney devotes a chapter of Inside Steve’s Brain to perfectionism. Jobs is absolutely uncompromising in his expectations. He demands the best employees, the best advertising and the best possible product. He is also described, unsurprisingly, as a “control freak” who is not content to merely produce gadgets. His insistence on also providing software and content, as well as overseeing the company’s marketing, has proven to be one of Apple’s greatest competitive advantages. An in-depth section devoted to the development of the iPod offers a fascinating look at Jobs’ creative process as well as a revelatory illustration of the points Kahney makes throughout the book. Special attention is also given to the development of Apple’s retail stores. With their unique look and famous “genius bars,” they are the fastest-growing chain in retail history. Inside Steve’s Brain is peppered with anecdotes and case studies illustrating how each of Jobs’ personality traits has contributed to his success — from founding Apple with Steve Wozniak through Jobs’ ouster from the company and on to his eventual triumphant return. Kahney relies on previously published accounts as well as first-person interviews to tell his story. Many of his interviewees are refreshingly blunt in their recountings of Jobs’ behavior, missteps and successes. The end of each chapter offers a list of takeaways labeled “Lessons from Steve.” Some are surprisingly counterintuitive, such as: “Don’t listen to your customers. They don’t know what they want.” Others, such as, “Find a passion for your work,” are more like reminders. And some are both useful and interesting. For example, “Don’t worry where the ideas come from” emerges from the fact that the scroll wheel on the iPod was suggested by a member of Apple’s marketing department. 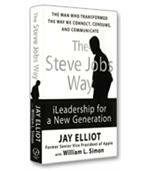 Inside Steve’s Brain offers a fascinating look at one of the most influential business leaders of our time. By taking a “warts and all” approach, Kahney is able to paint a portrait of his subject that feels true. Jobs may be a genius, but he also has some basic human foibles. It’s how he channels these foibles that sets him apart. 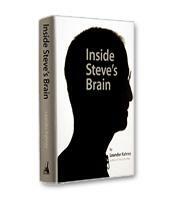 Careful readers of Inside Steve’s Brain will find the guidance and inspiration to do the same.